I promise I have non curly hair related posts in the works. However, there’s another hair product review post ahead. The Camille Rose Naturals Curl Maker is a pricier product, retailing at $22 US or $30-ish CDN for 12 ounces or 355 mLs. It’s only available in Sally’s Beauty Supply in Canada, or other specialty beauty supply stores but is readily available online from Target and a bunch of other sites. I know in the US, it’s available at Sally’s Beauty Supply, Target and a bunch of drugstores. The product contains a bunch of naturally based ingredients, is cruelty-free and made in the US. I’m 99% sure it’s vegan too. Camille Rose Naturals claims “our Curl Maker Curl Defining Jelly is handcrafted with marshmallow and agave leaf extracts”, will define curls “without the crunch” and will “eliminate frizz, moisturize and define curls”. In my experience, it definitely helps curls and waves to clump and acts as an enhancing product. It minimizes frizz and adds smoothness and hydration. I don’t experience any crunch with this gelly but I also find that it has maybe light hold on me and consequently follow it with a harder hold gel to get good results on my fine looser pattern of curls and waves. I know that those with a tighter curl pattern can use this gel on their own and enjoy doing so. The below picture on the left is my hair early on following the Curly Girl Method — fair warning my hair looks better now — with this product layered underneath a harder hold gel, and the picture on the right is my hair refreshed with this product. Now, let’s delve into the ingredients further. I consider it Curly Girl Method approved, meaning that it doesn’t contain sulfates, silicones or drying alcohols. However, the castor seed oil that the formula contains will require gentle surfactants to be removed and thus, might not be compatible with a shampoo-free regimen. The formula doesn’t contain any glycerin or other simple humectants that tend to be problematic in low and extremely high dew points. It’s really nourishing and smoothing with the coconut oil, aloe juice and castor seed oil. Curl Maker contains a fair number of ingredients classified as film-forming humectants that pull water into the hair and keep the moisture intact — some of these include: pectin, aloe, marshmallow root, nettle and panthenol. 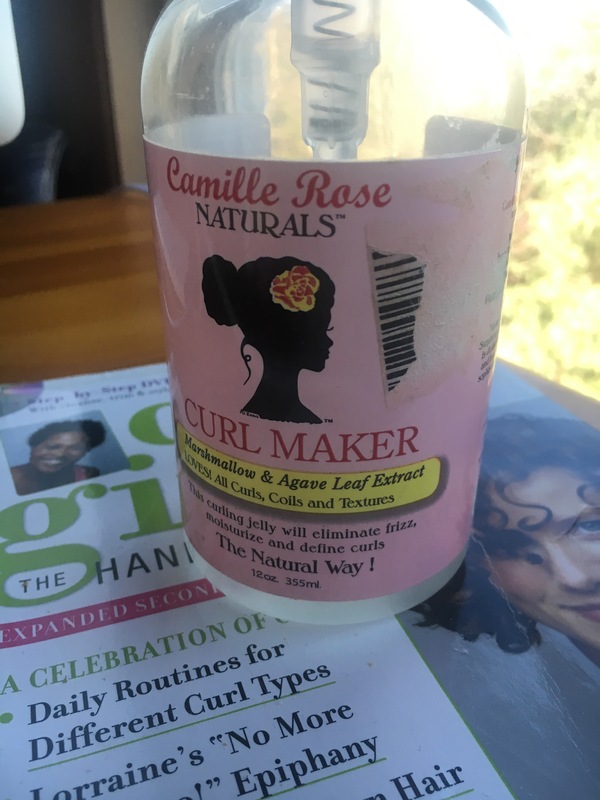 The Camille Rose Naturals Curl Maker does not necessarily give me the tightest waves and curls out of every product on the market but it certainly helps to encourage spirals and curl clump formation. It’s that perfect balance on my fine but high porosity hair of being smoothing and moisturizing without adding heaviness. The formula is protein-free but the aloe and the coconut oil have been known to act similar to proteins for those who’s hair is protein sensitive. As I’m nearing the end of my bottle, I plan on reinvesting in another bottle to use as a curl enhancing product and to refresh with. Also, in my experience this is defining but elongating. Has anyone tried anything by Camille Rose Naturals?